Rare indeed does one chance to live 97 years, even rarer does one live the 97 years of vibrant life that was Joan Wright's. A contribution to society and the environment second to none, a gift for teaching and leading through example, and a patient, endlessly cheerful disposition were the hallmarks of this truly unique person. A trained teacher and botanist, and a natural artist, Joan was one of those people with vision and the irrepressible nature to convert vision to reality. After life in the UK and time spent working in Africa, Joan and her husband, the late Dr. James Wright, arrived in north Queensland in February 1966 with their two sons Tom and Anthony. Joan was active in local government as a member of the former Cairns City Council, where she served briefly as Queensland's first female Mayor. 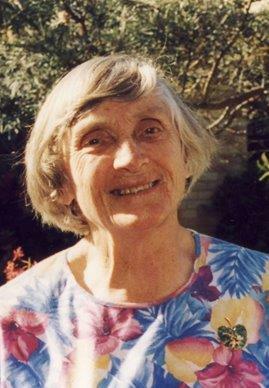 Later she turned her reputation for commitment to the Australian Conservation Foundation, and with help from poet Judith Wright and ecologist Dr. Len Webb, she organised the first conference on tropical conservation in Cairns in 1976. On James' retirement the pair moved to the tablelands and established their first property, The Cycads, amongst the forest oaks and pink bloodwoods on the edge of the lake at Tinnaburra. In late 1981 Joan met Geoff Tracey, a senior research scientist at CSIRO in Atherton. Both shared a passion for north Queensland and its unique natural environment, but both also saw the legacy of the past - eroding landscapes, dwindling forest cover, and wildlife in decline. Along with other Yungaburra locals like Bill Johnson and Les Barnes they began thinking about ways to reverse the carelessness of the past. In 1982, a meeting was called at the Yungaburra Community Hall to discuss forming a community tree planting group. It attracted a crowd of 30 people, and with Joan and Geoff leading, TREAT emerged. With help from Peter Stanton, Regional Director of the Qld. Parks and Wildlife Service, the group established a small nursery at Lake Eacham and began sowing seeds. I met Joan and James when I began my association with the first nursery at Lake Eacham in early 1984 and spent the next 30 odd years being humbled by her incredible capacity to make a difference. One could not help but be swept up in Joan's no-nonsense approach to getting things done. But one also had to admire her considerable skills in diplomacy and persuasion, borne out of a genuine concern to create a better environment. Joan was equally comfortable planting trees or negotiating with government, and her commitment to a cause was truly inspiring. Starting with those 30 members and under Joan's capable leadership, TREAT expanded to a membership of 600 by the mid 1990s. 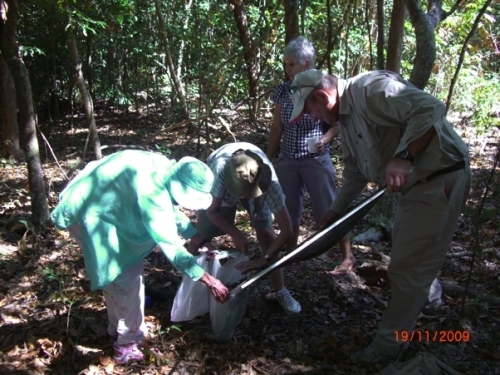 This growth in membership was matched by the breadth of the group's activities, as under Joan's careful tutelage TREAT's environmental education and awareness programs spread throughout north Queensland, teaching all generations about the value of native trees and forests, and their contribution to our natural heritage. As one of the co-founders of TREAT, the effect of Joan's knowledge and vision is plain to see - a community to which tree planting is now an accepted and mainstream activity, something which has enriched our lives and our landscape, and more importantly perhaps, helped to teach us that environmental problems can be solved, and the solutions are at our fingertips. John and Jenny bought this property of 50 acres in 2004. On the Ithaca River, it was overgrown with weeds so they had a couple of areas cleared with machinery and planted them with timber trees and bush tucker trees. As they currently live at Magnetic Island, Andrew Lilley is care-taking and managing the property. Over the last 5 years, he has been tackling the remaining weeds, harvesting and expanding the bush tucker trees, and planting and reclaiming habitat. The weeds along the Ithaca River are mainly Coral Tree, Camphor Laurel, Cherry Guava and Bramble, and getting rid of them is a big task. This will be an informative field day. After a walk around the productive and reclaimed areas, and a look at the weed problems, TREAT will provide an afternoon tea at the house. Meet from 1.45 pm at the entrance to the property. Parking is limited at the house, so please park on the verge of Third Avenue. Transport will be provided for those needing mobility assistance. Eleanor and Paul bought their 12 acre property in 2010. That same year they started clearing weeds and planting trees for wildlife in a gully area surrounding most of the property. They also planted a block of trees bordering the roadside as a screen. Some trees have been lost to frost, drought and weeds, but they have infilled and added to their initial plantings and have now planted over 6000 trees. To manage the aggressive grass weeds, they now use weed-matting over entire areas as part of their maintenance strategy. Meet from 1.45 pm to start a walk around the property at 2 pm to look at what has been achieved. TREAT will provide an afternoon tea afterwards at the house. Parking is available inside the property, but to avoid transporting weeds, if you have a vehicle with muddy tyres, could you please park on the road verge outside. Russell Road is accessed from either Lakes Drive or Moore Road, off Lake Barrine Road. On the 17th December 2015 we counted 25,523 PIPs flying into North Brook Island in their evening flight as they returned to their nests after a day's feeding on fruit in the mainland forests. We, being Queensland Parks and Wildlife Service marine park rangers, Girringun rangers and members of the Wildlife Preservation Society of Queensland. PIPs are Pied Imperial-Pigeons (Ducula bicolor) also known as Torres Strait Pigeons. They are those large pigeons, mostly white with a bit of black, seen along the Cairns Esplanade during summer. They come from New Guinea at that time of the year to breed along the coast of Queensland, often in very large colonies on offshore islands. One of the largest colonies is on North Brook Island, 30 kilometres out from Cardwell. In the 1800s and right up to the 1960s it was considered good sport to shoot the pigeons, despite their being officially protected and being breeding birds. The Governor of Queensland himself went ashore on North Brook Island for a shoot on 7th October 1865. “The sport was excellent - eighty-two birds falling to three guns.” Large shoots were occurring on North Brook right up to the late 1960s. We believe counting every year for 51 years is the longest bird monitoring exercise in Australia. How and why did it start? Arthur and Margaret Thorsborne, when holidaying on Hinchinbrook Island, took their tinny, powered by its Seagull outboard motor across the nine kilometres from Mona Island to North Brook on 12th January 1965 on a flat calm day. They saw these large white birds which locals later told them were Torres Strait Pigeons and that numbers had declined to the point it was no longer worth going out to shoot them. This surprised the Thorsbornes because they thought the birds were numerous. On returning to their Southport home the Thorsbornes spoke to Charlie Roff, Queensland's chief fauna officer, who told them that the only way to know if the pigeons were declining was to count them and to do that for 10 years. So, in December 1965 they travelled the 1,500 kilometre journey from Southport to Cardwell and made their first count on 29th December 1965. I was posted to Atherton in late 1972 as the zoologist for National Parks and met the Thorsbornes soon after that, just as their 10 years of counting was coming to an end. To their question of what they should do my reply was that the counts should continue 'for ever'. Not deterred, Arthur and Margaret kept up the counts and over the years were joined by many others. A count is made in the afternoon from 3:30 pm until dusk, as the birds return in small flocks. Two counters sit back-to-back either on the north-west sand spit of the island or on a boat moored immediately off the spit. One counter calls out numbers of pigeons crossing onto the island at the northern end, the other those arriving at the southern end. 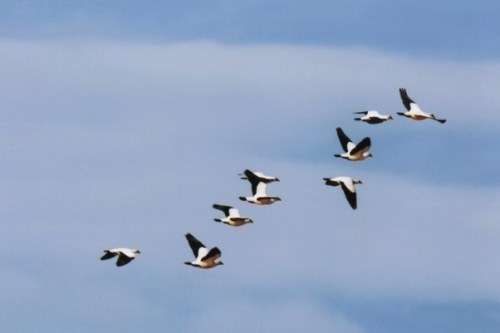 As flocks increase, the counters call out a steady stream of numbers with their recorders just managing to keep pace. A total of 254 counts have taken place, varying in number from one to ten in any one season. Since 2004 counts have settled to just three a year in October, November and December. The December count is the most important because it is used to compare numbers between years. The long-term count has provided three interesting insights into the PIP population of North Brook Island. Arthur and Margaret's first complete count was 4,692 followed by a steady decline over the next three years to 1,451. There is little doubt the decline was the result of regular shoots, with 1,000 or more birds shot at a time. The Thorsbornes were responsible for stopping these big shoots and pigeon numbers began to show an immediate up turn. This was a slow, but steady increase to 30,000 in the 1992-93 breeding season. It probably represents the increase from normal hatching success and mortality. The population then levelled out, though with considerable variation, between 25,000 and 35,000 until Cyclone Yasi devastated both the pigeon's breeding ground on North Brook and the mainland feeding area in the Cardwell district. The following year numbers dropped to 5,311 and we feared a major catastrophe had hit the North Brook pigeons. However, the next year they bounced back to 21,088 a number impossible to have reached with one year of breeding. Our simplest explanation is that the birds spent the summer following Yasi elsewhere and returned the year after. Admittedly not in numbers preceding Yasi and only continued monitoring will tell us when or if numbers return to pre-Yasi levels. 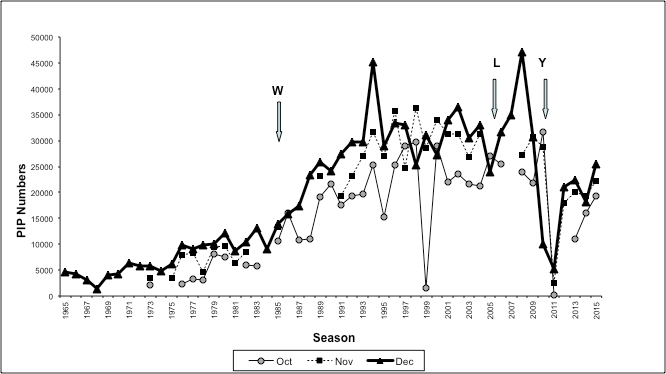 Graph showing the counts for the months of October, November and December. Arrows indicate where the Cyclones Winifred, Larry and Yasi came ashore. As an aside to the counts, bird-dropping traps were set out under pigeon nests and the collected seeds raised in the Girringun and Tully plant nurseries. 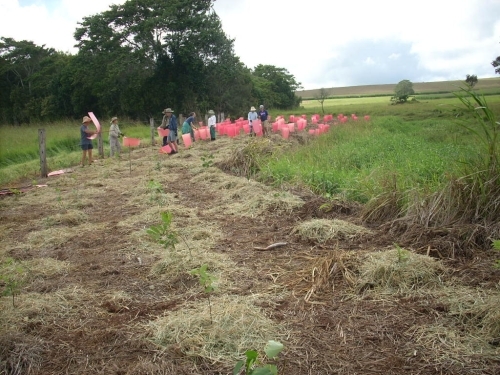 The seedlings were then used in forest plantings along the local coast with trees known to be Torres Strait Pigeon food trees. A strength of the counts is that it has brought together many sections of the community. 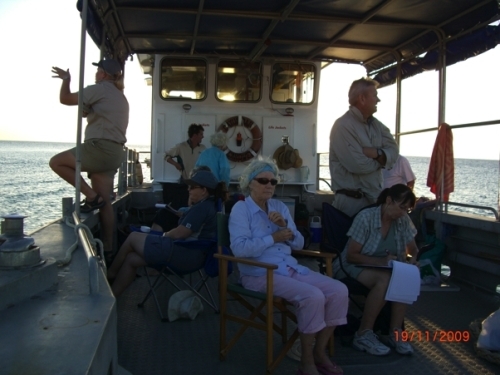 The Marine Parks section of Queensland Parks and Wildlife Service have provided boat transport to the island and acted as coordinators of the counts, the Girringun rangers have become regular participants in the counts, and many of the counters are local volunteers, including members of the Wildlife Preservation Society of Queensland. The counts are now recognised as part of the Coastal Bird Monitoring and Information Strategy for the coast and Marine Parks have agreed to provide transport for two counts per year (November and February) and a coordinator of the counts. This means that the Wildlife Preservation Society of Queensland will be seeking funding to charter a boat for the October and December counts as it is agreed that long term monitoring of the pigeons must continue. All of us who care about nature value the goods and services which are associated with the environment. The valuing of a healthy environment seems to take a back seat when times are tough economically and this can be seen by the lack of government environmental funding over the last few years. The state's Everyone's Environment grants program providing small grants is still active, and the 20 Million Trees grants have supported two projects in the Wet Tropics but this is insignificant compared to past cycles such as the Natural Heritage Trust grant initiatives. The Regional Body is providing small grants to keep on-ground activities of environmental groups ticking along but they also are insignificant compared to past funding scales. The $200 million promised by the state and federal governments addressing pollution impacting the Great Barrier Reef doesn't seem to have hit the ground yet. I suspect that it will go to the cane industry to change and improve practices, without 'hitting the ground' fixing up sediment and water quality issues in non-productive and environmentally significant areas. The Landcare initiative developed in the early 1990s with plenty of runs on the board has also had little monetary assistance to talk about and in fact this program has taken a hit. CSIRO ecological services in Atherton will soon be non-existent if predicted staff cuts go ahead. The Abbott federal government developed the Green Army employment initiative and this seems to be where the majority of federal environmental allocation is going in the north. 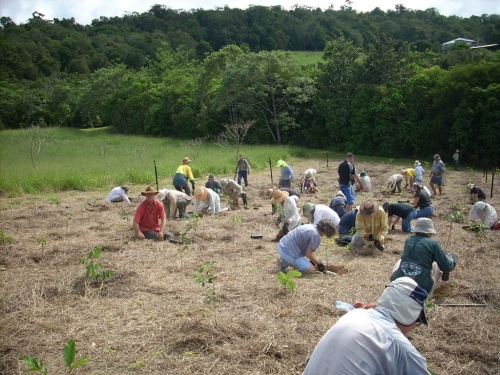 Conservation Volunteers Australia is the provider of the current Green Army teams for Atherton. Terrain NRM applied for three six-month teams based in Atherton (which was awarded) and two teams have already run. The teams have been based in Mabi forest areas assisting catchment and community groups. Their duties have included the makeover of old revegetation plots, general weed control and some tree planting. Given how quickly sites can be overgrown by weeds and the lack of resources to treat old revegetation sites, the Green Army teams have been mainly controlling weeds. They have done a great job given how hot and dry the weather has been. A couple of the participants have gained traineeships with the local council, which is a good outcome from the program, but the others will struggle to find jobs in the industry with the lack of support for the environmental on-ground sector. With the current problem of the country being in too much debt and the argument between political parties about how to fix the problem, the environment is coming a long last in this situation. Coupled with this, individuals are given a platform in the media to attack anything with a 'green tinge' arguing jobs are more important. Policy setters and decision makers are putting their effort into growth and jobs. Yes, we all want jobs and a comfortable life style but we all definitely need a healthy environment. Green = common sense when it comes to repairing degraded landscapes and protecting nature in general. It's caring for the long term, not pulling economic benefits in the short term. Here in north Queensland our environment generates jobs through tourism, agriculture and fisheries and it is imperative to invest in keeping the seascapes and landscapes healthy. Many committed groups and individuals have been doing their thing for years as far as assisting the environment but at the moment they are running on a shoe string. Wins up here in the past have happened through lobbying; for example the World Heritage listing, establishment of the council-based Wet Tropics Tree Planting Scheme nurseries, and the Peter Garrett intervention at Mission Beach. It's time to lobby with an election on the horizon, and get the ear of political parties. The best way at the moment is for Landcare, researchers and catchment and community conservation groups to argue what they will do to help the Great Barrier Reef (GBR) and perhaps tap into the GBR $200 million pollution abatement allocations. The GBR is in the global limelight at the moment and decision makers cannot ignore the tourism sector and community concerns. It is very important to keep the capacity of the on-ground community groups and the associated research sector. Momentum has been built over decades of on-ground actions. The current funding allocation to the Landcare/ environment sector is low and needs to be reinstated with interest. If we had the resources required to continue environmental remediation works then Green Army participants may have a job to aspire to after their traineeships. To help the cause, a few locals behind the scenes are lobbying for a rethink of current environmental funding and it is time we all joined in. Write letters to all political parties in Canberra. Community power through a squeaky wheel approach is the only way. 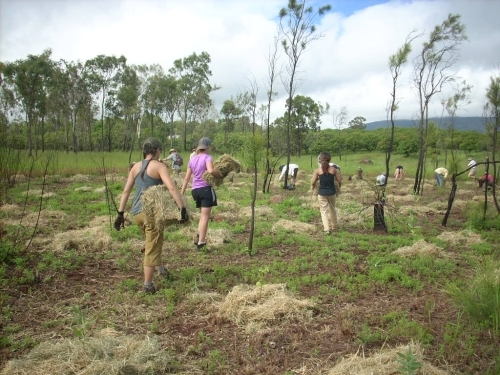 The Community made another huge effort this wet season to plant approximately 20,000 trees into the landscape. Unfortunately the rain failed us again and not once did we need raincoats as we planted. Some plantings had irrigation set up, but the others needed hand-watering of the trees. Hopefully we may get some winter rain and not too many of the trees will die. All plantings are now using water crystals as well as fertiliser. Maintenance of plantings used to be just spraying and fertilising at appropriate times, but now watering will need to be factored in as well, until the trees establish. This was the first planting for the season, a popular time and place, and over 60 people had the planting of 3500 trees finished soon after 9.30 am - many turning up before the scheduled 8 am. Trees had been laid out the previous afternoon and fertiliser and water crystals added to the holes the previous morning. There had been some rain during the week and the holes were partly wet, but the irrigation was turned on as the planting finished. Watering has continued when necessary, volunteers assisting with the refuelling and pumping to different lines. The BBQ afterwards at Ian's shed was provided by TREAT's Team 1 to their usual high standard. This was an infill planting (at Cedarvale) of a planting done last year in winter, where many trees had died. 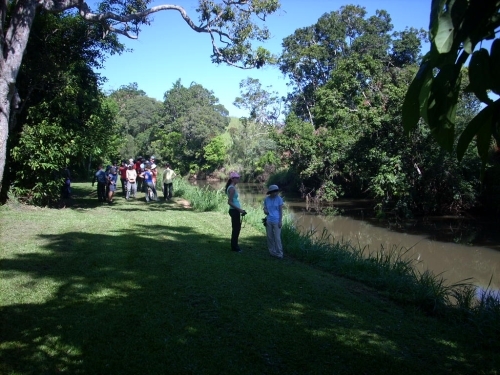 It is part of a large area which has now been fenced, for use in rehabilitation of cassowaries and other wildlife. There was a good roll-up of volunteers including 17 students from the School for Field Studies (SFS), newly arrived from America at the beginning of the week. There had been little rain and the holes were dry, so watering afterwards, with hoses from a tank on a trailer, was essential. This was done by Phil and an employee. 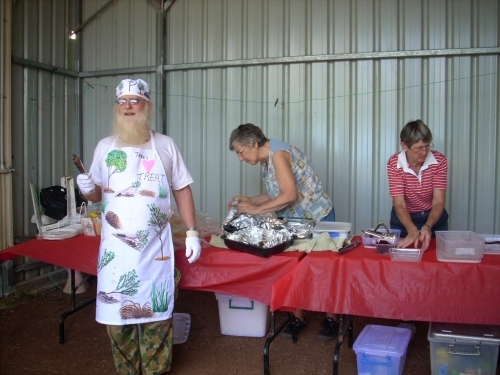 The weather was hot and sticky and the BBQ afterwards most welcome at the large cool shed on the neighbouring Barrine Park. This time it was provided by TREAT's Team 2, the 'Dream Team'. Here, Geoff Onus spoke about Carolyn and Phil's new project 'Rainforest Reserves Australia' which purchases and revegetates significant land for wildlife. This planting was combined with a field day to showcase the revegetation which has been done on the property, with community help, since 2006. Geoff Onus (North Queensland Land Management Services) was in charge of this planting and because of the dry conditions, he decided to plant only 300 trees (many in 120 mm pots) in strategic places, instead of the intended 1000 trees. Those volunteers who arrived after the SFS students, had little opportunity to plant a tree and the planting was finished before 9 am. Each tree had large biscuits of hay put around it and was watered by irrigation. About 70 people came to this planting/field day and the Bonadio family were busy with extra cooking for the BBQ, so Ron Bonadio took us on a walk along the river bank to hopefully see a platypus. We didn't see any but were able to observe the bank armouring work done at points along the river, revegetation work and the construction of detention ponds. Back at the BBQ, at the family's 'Lower Camp' for their tourists, we were treated to great food in a great setting. After a talk about Barron Catchment Care's 'Green Corridor' project, which includes revegetation on the Bonadio's property, we walked along an access track towards the bridge on the Gillies Highway. Geoff stopped at an area to show how useful Casuarinas had been in establishing revegetation on the low banks which were prone to frosts and floods. They not only survived both but their litter allowed other seedlings to germinate happily. At the bridge revegetation area, a fence deterred animals from crossing the highway, encouraging them instead to go under the bridge. These three plantings were on steep slopes at Upper Barron and were part of a TKMG (Tree Kangaroo and Mammal Group) project to link a large patch of private forest at Upper Barron to the Herberton Range National Park. This year the plantings were widening the corridor. The first planting was at the bottom of the hills, the second further up the eastern hill and the third closer to the top of the eastern hill. After last year's dry planting, tanks had been installed to water the trees, and they were needed this year for all three plantings. Preparation for these plantings is a massive job, up and down the hills, and each hole has to have the long grass chipped away before the hole can be augered. This long dead grass does provide good mulch for the young trees after planting, and is easier to pull away the longer it has been dead. The weather was sunny and hot for the first planting. Better conditions prevailed for the second, and it was windy and cool for the third, with even some light spits of rain. Scrubfowl calls in the nearby forest greeted us at the first planting and Chowchilla calls were an additional pleasure for a while at the second planting. A Conservation Volunteers Australia (CVA) team was present at all the plantings and the SFS students came to the 2nd and 3rd plantings. 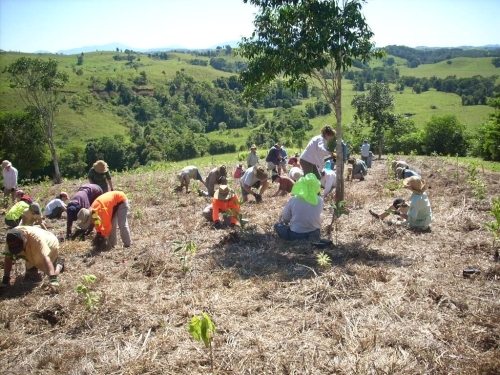 The first planting was extended after the scheduled 2500 trees were planted, to help the small CVA team that day with their scheduled planting - they were watering all the trees afterwards. The BBQs were all held at the shed on the hill across the road and the TREAT 'Dream Team' did the catering - Elizabeth makes a delicious iced carrot and walnut cake. This was the final community planting to be held at Mark and Angela's property 'Ringtail Crossing'. Starting in 2004, they have now created a corridor from their private forest to the Herberton Range National Park. This planting was widening the corridor on the eastern side. Their work and approach to revegetation has become a great example for others to follow and it has been rewarding to see the plantings grow each year. It was a hot and cloudless day for the planting. There were plenty of volunteers, including the SFS students, and the planting was completed by 10 am. TREAT's Team 1 provided the BBQ afterwards at the shed, with a Gazebo for extra shade. After we left, Mark and Angela still had the task of watering all the trees. This planting had the best conditions. The soil spoil from the augered holes was damp from recent rain, the morning was cloudy and somewhat misty, and it rained later in the afternoon. The planting was next to the road and alongside a small creek which flows into Massey Creek and was extending the QPWS project to widen a narrow corridor within the Tully Gorge National Park. The trees had been put out the previous afternoon, but fertiliser and water crystals were added the morning of the planting. With about 40 people, the planting was completed soon after 10 am. QPWS had set up irrigation, and this has been useful since. TREAT's BBQ was provided by Team 1. QPWS had slashed a track around the infill area planted last year, so several of us went to see how things were progressing. That area now requires minimal maintenance, with the larger trees providing shelter and cover for many of the smaller ones. This planting was improving connectivity in sclerophyll country from the Mt. Emerald range to Barney Springs and the Lamb Range. 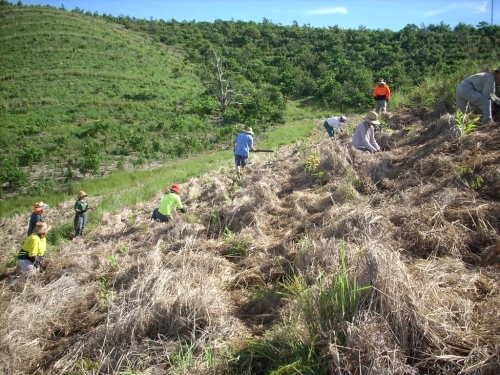 The Tablelands Regional Council (TRC) did the site preparation for Barron Catchment Care, and the sclerophyll trees and shrubs for the project were grown by the TRC nursery. Over 50 volunteers turned up and these included 19 American students from the School for International Training. Besides planting, there was a lot of mulch to be spread around and the students handled this task with youthful enthusiasm. At the BBQ (provided by TREAT's Team 1) Kylie Freebody spoke about the project, the species grown and the maintenance program which will include fire management. This was an additional planting for the season. It was extending the planting done last year at the bridge on Peeramon Road. A new area was planted on de Tournouer's property and several infills were planted on Mather's property, both areas adjacent to the creek. As well as planting, there was mulch to be spread and frost guards to be put around the trees. Although some showers had wet the soil, we also watered the trees for good measure, the creek being so handy. The frost guards were the ones stored after last year's use. There were 35 volunteers and we finished the tasks in about the usual time taken for larger plantings. The BBQ (by the 'Dream Team') was a time to reflect on a busy season. After a promising local start in December to the Wet Season, the weather just seemed to get hotter and drier through January and February, and even into March, with only a few localised storms and the odd rainy day. Many people were lucky to record anything at all in their rain gauge, and members were frustrated by the poor prospects for successful tree planting. Still, the scheduled community tree plantings all went ahead, though some will no doubt experience substantial losses. Even those where the site was well irrigated, such as TREAT's Peterson Creek project at Ian Freeman's property, can expect losses due to extreme temperatures during January and February. In contrast, the QPWS Massey Creek community planting on March 5 was an enjoyable morning following a couple of days of solid rain. This brought some relief to tree planters weary from the preceding couple of months, with many proclaiming how good it was to plant in the cooler conditions and to actually get mud sticking to their hands. Thanks to everybody who was able to assist with the planting at this year's site, including the QPWS rangers from Lake Eacham who dug the holes in pouring rain. Sadly, in March, we learned of the passing of Joan Wright whose vision created the inception of TREAT. As a QPWS ranger who had the privilege to work with Joan, I would like to acknowledge the guidance she offered and her great contribution to nature conservation in northern Queensland. Her wise words and sense of humour (occasionally stern) will not be forgotten.